Confusing, quite boring episode written by somebody who wasn't closely associated with the series. However, there was an interesting gang of villains, including Neil McCarthy's taciturn thug, the scenes with Bodie and Doyle cruising the streets to a softer version of the theme tune were nice and as ever, the action near the end (Bodie fighting a dog) was excellent. Why on earth would CI5 be involved in a case of stolen art treasures, plans for smelting, etc? I suppose to stop them going behind the Iron Curtain? A bit of a lame excuse really. Not a whole pile of action in this one but I still found it very enjoyable especially when Doyle has to go undercover at the Wurzel Police Station. I love the way Doyle rubs up the yokels the wrong way! Again, as in the previous episode 'Black Out' there are some nice summery shots of rural England. The cast: Moray Watson is very cool and quite nasty as the chief villain and Neil McCarthy plays a usual standard heavy role. The lovely Prunella Gee is rather wasted in an underwritten part. Not too exciting but by no means a real dud. This is a strange one. I really like the punch up at the end and the fact that Bodie & Doyle are working together for the first part of it all. However, the story just seems to be a little over structured to me ... each scene clearly leads from one part to the next, all way too obviously linked together and not really plausible.The Colonel Sangster character hardly seems the sort that CI5 come up against but I can sort of live with that. For me the weak part of this is the nothing start ... no real hook or shock before the titles roll, and the predictable way each scene mundanely plods from one stage to the next. The villains in this don't come across as fellow Professionals to me despite Cowley talking them up - ok Armitage is a nasty bit of work but nothing on some of the ruthless killers CI5 come up against - Tibbs is a weed to be honest. I am not sure why Bodie & Doyle are so alone at the finale. Surely Cowley would have had a few others on this with a million quid at stake? I agree with the above comments, I like the way Doyle winds up the locals and also like the way Bodie is nicked too - I laughed! This one just seems to lack any real sparkle unfortunately, but the finale is pretty good. Doyle way too slow off the mark while Bodie takes on ALL the bad guys. Surely there must have been a better plan to take the villains down? 7/10 - not the best episode of The Professionals unfortunately but watchable as always. One of my cousins who's coming over this weekend was born on that very day. Another good reason to watch this then. This really comes to life in the final minutes which is great because the rest is fairly dull. Why would CI5 be involved? The guest cast is good it's just too bad they didn't have a better script to work with. Oh well, at least it's not as bad as The Gun! Well that was a f*cking ordeal. Bodie pistol whips a dog, Doyle sets fire to a rag and Cowley does a lot of talking. The lads look well and truly bored throughout and I almost fell asleep. On the positive side, it was nice to see Letchmore Heath and the Three Horseshoes pub - filming locations for The Village of the Damned. I went there about ten years ago; hasn't changed much but had no idea that this was the pub in which Bodie asked someone if his dog would like to chew an electric fire. Wish I'd realised at the time. Can't in all honesty recommend this to anyone, unless they are losing the will to live. This will finish them off. This was a trying episode to watch even for a dedicated fan. 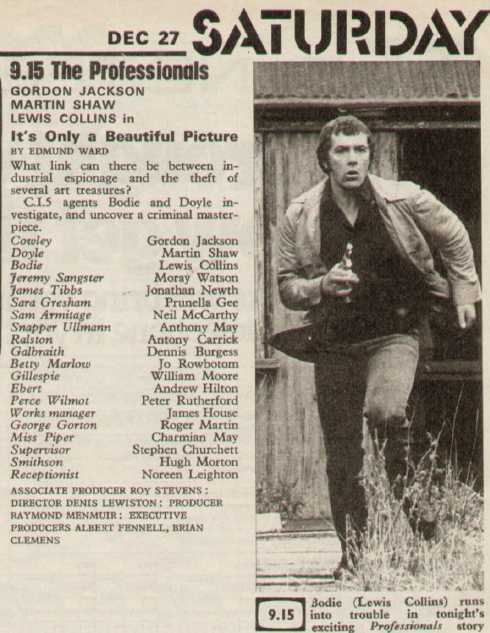 One positive was that Lewis Collins was looking particularly fit in this episode. I remember there was a scene of Bodie and Doyle walking in Trafalgar Square. I always liked it when big public places were used in the shows. I can't imagine how hard it must have been to stop fans approaching the actors. I vaguely remember spotting a fault in this episode but I'm not sure I'm prepared to rewatch it to find it again ! I agree,the hype of this show karinb at its peak,must have been near impossible to find location shoots withought being bombarded with fans and onlookers.